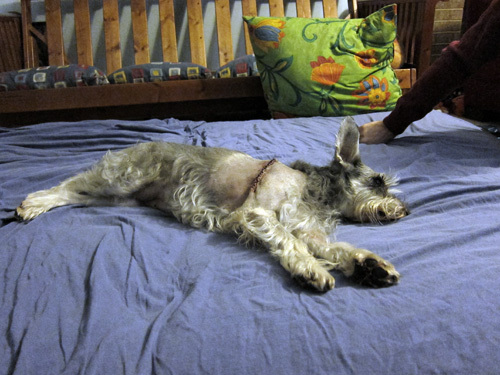 The week before we left for London, we found out that pup had a mast cell tumor on her right shoulder. 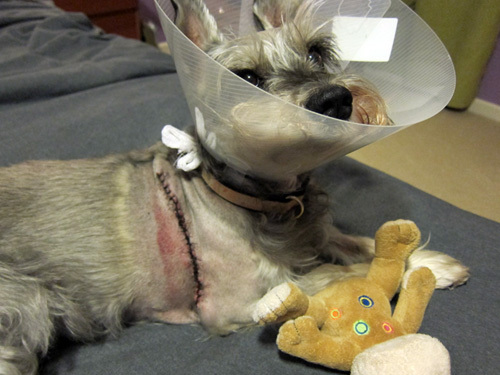 It was cancerous and needed to be removed, so we scheduled the surgery for the day after we got back. We wouldn’t know if it was a Type I, II or II until we got the results back from the lab in 5-7 business days. Because she wasn’t supposed to be climbing stairs, we all slept downstairs on the futon mattress for a few nights until she got her energy back. Two days after surgery she was back to full energy, “protecting” the house from squirrels and running around like her usual self during the day. Thankfully, we received great news a week later that even though it was a Type II tumor, the histology report came back with clean margins, so the surgeon got it all. They consider this curative and all of us are quite relieved! 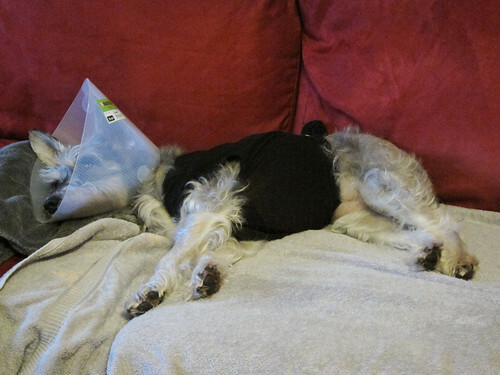 The cone prevents her from licking the wound, and the shirt seems to help her not scratch her side until it can heal completely. Hopefully both can come off soon.